Kilkenny offers you the ability to walk around to all the sites and also experience the ambience of this fabulous medieval town so steeped in history. What a thrill for Debbie, on her first visit, to pass a portion of the original city wall as we walked from St Canice's to the Black Abbey. 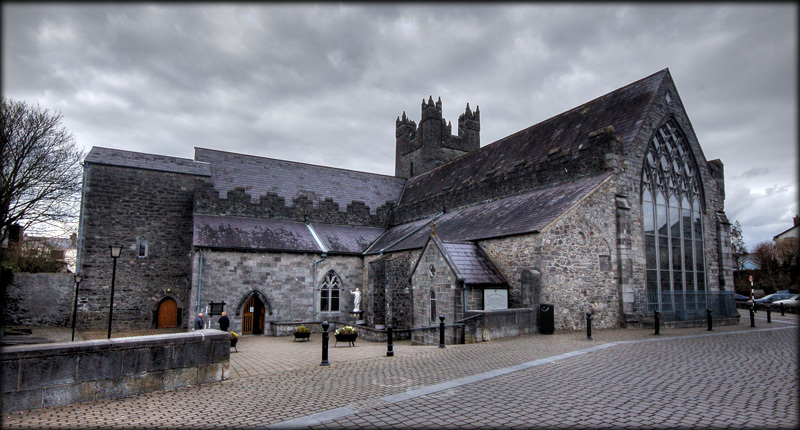 At the time of the abbey's foundation by William Marshall the Younger for the Dominican Friars in 1225, the town of Kilkenny was divided - one half an Irish town, the other English. The abbey was built between them and outside the city walls to demonstrate independence from either side. 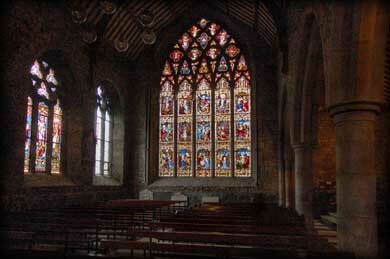 The abbey was at the Centre of civic life in Kilkenny for centuries. The name "Black Abbey" was derived from the black cloak worn by the Dominicans ("Black Friars") over their white habits. Originally built in a typical Dominican style, little now remains of the early church except the lower part of an ancient tower (which predates the church), and the old nave. After repression in 1543 it was converted into a courthouse but later fell into ruin. 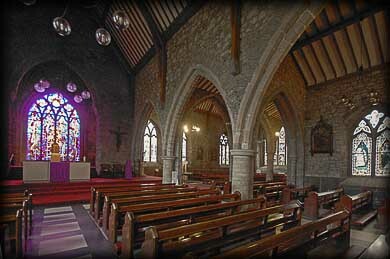 Fortunately, the Dominican Order regained possession in the early 19th Century, restored the nave and transept, and the church has been a place of public worship since that time. Near the altar is a 15th Century alabaster statue of the Holy trinity that was found hidden in a wall. 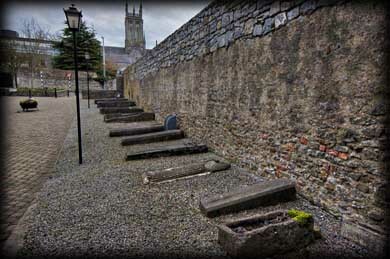 Outside the entrance are 13th century stone coffins and slabs, pictured below, that were also uncovered during restoration. We were also amazed by the size and beauty of the "Rosary Window". Created in 1892, it is the largest stained glass window in Ireland, and the colors and scenes depicted glowed vividly in the bright light. Situated: On Abbey Street in the heart of Killeen City. Discovery Map 67: S 502 561. Last visit March 2011.